Q. What are the advantages of using shrink wrap instead of tarpaulins? A. More productive days during the project; saves time and money; better weather tightness; building team doesn’t have to worry about adjusting covers; site operational in any weather conditions; no noisy flapping to disturb your client and their neighbours. Q. What type of material is your shrink wrap made from? A. 200-micron, premium grade 100% virgin resin film. Q. What are the advantages of using this wrap material? A. It’s 100% recyclable. The wrap reflects harmful UV rays, reducing the risk of sunburn affecting staff working on the scaffolding, such as painting crews. It can withstand weather extremes. It’s extremely consistent in thickness, and is rigid when shrunk in place. Q. What are the benefits of using your shrink wrap on a home building site? A. By shrink wrapping your building, you keep the wind, rain and burning sun out, and safely contain within the site all the dust, dirt, and debris generated by construction, recladding, or renovation work. Q. 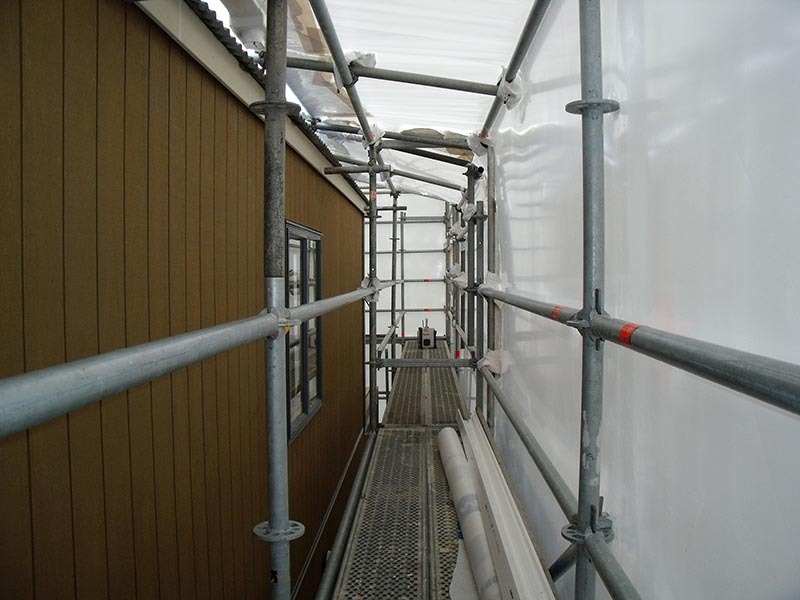 Are there economic benefits of installing shrink wrap on a construction site? A. Yes. The main dollar related up-side is there are no weather hold-ups, so work can continue on schedule, and within budget. Q. What are the most common types of shrink-wrapping jobs that you do? A. Renovations, demolitions, hazardous substance containment, stages for events, leaky homes, plastering. Q. What is the most hazardous substance you’ve contained? A. Asbestos. Each job is site-specific and dependent on the situation. Q. How long does it take your team to wrap a house? A. A standard house and with good weather, we can wrap in 3/4 days. Q. Is it voluntary or compulsory for buildings being constructed or renovated to be clad in scaffolding and shrink wrap? A. Where hazardous substances are involved a site must be wrapped. Otherwise, it is on a case-by-case basis. Also, if you want to negate weather delaying a project then whilst not compulsory it should certainly be preferred. Q. How does your plastic wrapping stand up to a Wellington zephyr? A. Our installed product can withstand wind gusts in excess of 120km/h. Q. Why is shrink wrap so good for storing assets? A. Because it completely moulds itself to the shape and is weather and dustproof. The UV-reflecting plastic in the wrap reduces fading, and security is enhanced. Q. What happens to the wrap once the job is finished? A. We recycle all the plastic wrap we install once it’s done its job. Q. Is there a limit to the size of building or object you can wrap? A. No, we can wrap anything to protect it from dust, damage, vandalism, and of course, the Wellington weather. Q. Whats the weirdest object you’ve ever wrapped? Q. Whats the biggest thing you’ve ever wrapped? A. A very large house with interesting dimensions. Q. How long can the wrapping last? A. It’s guaranteed to last 12 months in New Zealand conditions, so it’s tough! Q. Is your wrap only available in white? And why white? A. The wrap is white to let the maximum amount of natural light through. We also supply black, clear, and fire-retardant shrink wrap, so there are options available to suit all requirements. View more about Supreme Wraps services and how we can help you.